Case Study: Meet Oscar... Oscar used to Kill Chickens and Nothing would stop him - Check out the kit, how it works and meet oscar. Here's How the Pet Barrier Dog Fence Stops Dogs from Escaping. It’s a complete Pet Barrier Radio Dog Fencing System with 7 Key Features to suit any Property, Dog Breed, Size or Temperament. No More worrying about losing your dog, expensive pound fees or BIG Vet Bills. Just you, confidently giving your dog the complete freedom of your property, saving you money, time and a whole lot of stress. Best part is, it’s all ‘Pre-Prepared’ ready to plug in and test straight out of the box. You can check out our 7 key features and see it all working within minutes. We also include our easy Installation guide and step by step gentle dog training programme that makes it really easy on the dog to make their own decision not to go near the Boundary. Plus you’re backed up by our 7-day helpline. ...we show you how our 7 key features will ensure that the product will last a long time and your dog is comfortable inside the barrier all with minimum fuss for you or your dog. This system works best for dog owners who don’t want to risk failure and need to get it right first time. We replace a lot of Dog Fence Systems that just did not work and ended up costing a lot more in the long run. Fill-in the form below and receive our Free Dog Fence Buying Guide featuring the 5 questions you need to ask before you buy a dog fence and learn more about our 7 key features. We can also send you a personalised quote to make sure you get the best dog fence system for your dog and property. Step 1 - In Your Dog Fence Journey... Download our FREE Buying Guide and check out the 7 Critical Points, That Ensures your Dog's Long Term Safety. 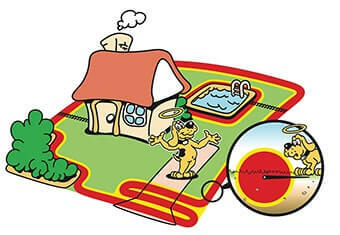 Programmable levels for easy training and Containing STUBBORN DOGS. A Dog Chew Warranty on each receiver Collar - Tuff Poly-carbonate Housing. 3 year - Lightning/Fusion Damage Warranty on the Transmitter. Long Battery Life for Receiver collars and features 3 Aerials for guaranteed boundary signal detection. Lifetime Telephone support (1300 843 364) and dog training line. Most people come to us as frustrated and worried dog owners. They have been barricading fences, paying pound fees every time their dogs escape and get caught by the rangers. They say that they always had to close their gates and their dogs can still escape. They're tired of paying vet bills as well every time their dogs get injured when escaping. After following our Training guide there dogs have the freedom of their whole property - relieved that they don't even have to close their gates! 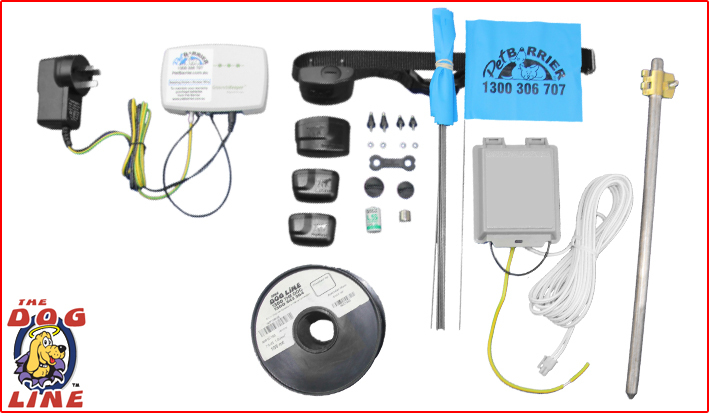 The best electric dog fence in Australia is packed with awesome guarantees & warranties such as the Pet Barrier Dog Fence System - it comes with a super strong wire, a surge protected transmitter with unique FM radio digital coding, and a durable receiver collar. Plus... it can all be taken with you if you move house - Just simply roll up the wire, and off you go. There is no need to bury our wire with it's 20 year UV rating and 2mm HDPE coating - it will surely last you YEARS. Our Unique Warranties will also add years of consistent success to your Dog's Safety (and your peace of mind). • Battery Life Guarantee - Up to 2 year Battery Life - if our 'Super Battery' runs out within 8 months YOU GET A FREE BATTERY. There is no need to bury our wire... Simply hang it on the fence and take it all with you if you move house - 7 Strand Copper core with a HDPe Coating and a 20 year UV rating. 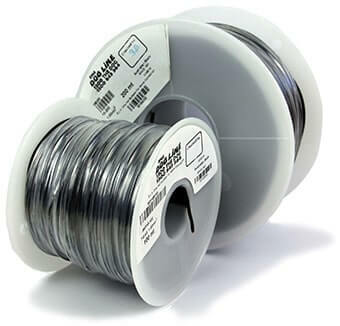 Click here to check How much wire do I Need? • How does an Electric Dog Fence Work? • Will an Electric Dog Fence Hurt My Dog? • More from the Electric Dog Fence. • Why choose an Electric Dog Fence over a Traditional Fence? • What do I get in Electric Dog Fence Kit? Imagine never having to Close your gates again - Worry 😟 about your dog jumping over the fence - Stressing about your dog destroying your garden beds. To find out how to do this, simply fill in the form to have our FREE Buying Guide delivered to your inbox. All you have to do is Select your Starting Kit - Add Extra Wire and Add Extra Dog Fence Receiver Collars 🐕 (if needed). We send the kit to you ready to go... just plug it on the kitchen bench and read the manual, installation guide and training guide. Just real quick… How Does an Electric Dog Fence Work? Yes, they all pretty much work the same but... Check out the differences below. It’s pretty simple, Run the wire around your property - follow your desired dog fence layout but the wire should come back to the transmitter to create a closed loop. Through this, the radio signal will have nowhere to go but outwards from the wire - creating your invisible fence boundary which is more effective than the traditional fence you've got. 1. The Electric Dog Fence Transmitter is protected by a transformer that regulates the power supply. 2. The Transmitter sends a coded radio signal through the wire. 3. The Wire receives the radio signal from the Transmitter and emit it out. 4. The dog containment collar reacts to the coded radio signal from the wire around your property. 5. Since the system operates with a uniquely coded FM radio signal, your dog will not get incorrectly zapped by stray radio signals from other electronics. 6. Once your dog enters the warning zone (usually a 3ft distance from the wire), he will get a beeping tone as a warning. 7. And once he goes beyond the warning zone, he will get a safe static correction. 8. Thus, preventing your dog from escaping your property. It sounds Simple and it works... but there is a lot that makes the best dog fence system. Continue reading to know why the Pet barrier Dog Fence is the Best Dog Fence System you'll ever need. The Electric Dog Fence saves you money, time, and stress (for rescuing your dog from the dog pound or worse, bringing him to the vet). • Keep your dog safe in your yard. • Protect your gardens from getting destroyed. • Prevent your dog from jumping over or digging under your traditional fence. • Protect several dogs at once. 10 Years ago we swapped over to this kit. If your dog fence system breaks down... you might as well put it all in the bin. But with the special safety features of our Dog Fence System in the Power Supply - Transmitter - Wire - and the Receiver Collar. We don't get the problems we used to get - and neither do our clients. We have different combinations of kits with 7 Unique features to ensure LONG TERM SUCCESS. Think you need this for your dog? Download our FREE Buying Guide now to avoid the COSTLY expense of buying the WRONG Dog Fence Kit - for the wrong dog on the wrong property. Will an Electric Dog Fence Hurt My Dog? Absolutely not… We wouldn’t be recommending it if it does… We have our own dogs too and they are perfectly alright with the Invisible Dog Fence. You see, this kind of dog fence will only teach your dog a specific boundary that he should not cross by distracting him through the mild static stimulation (and beeping tones). Therefore, the static stimulation from the dog fence collar alone, cannot possibly hurt your dog in any way. Take note that humans are more likely to get hurt by static pulses from electronic devices since we have thin and oily skin whilst dogs have fur, thick and dry skin. 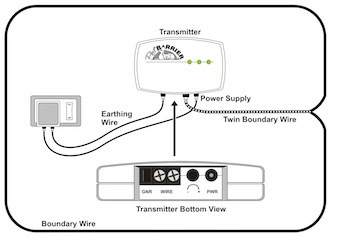 The Coded Digital FM Frequency on the wire means your dog's Receiver Collar will not get accidentally activated by stray radio signals, and the Regulated Power Supply in the transmitter will not allow a sudden surge of energy to expand the radio signal into the wrong areas and give false corrections (this will also control 'Signal Bounce' and 'Signal Coupling’ issues). Now, the Multi Level Collar will allow you to adjust the distance of the radio signal and then set the level of the collar to low training levels and then much higher levels once your dog is familiar with the new boundaries. Also, these receiver collars have the fastest 'Reaction Time' (1/8th of a second) and an advanced Multi Detection Aerials System in case your dog charges to the fence (now this should never occur because of our easy to follow training guide). The Chew Warranty is more beneficial to your pocket. Dogs LOVE to chew, right? Yes… we also knew that some dogs will even sneak out for the collar to chew it. Don’t worry! The collar is actually made of poly-carbonate so it’s super strong and durable BUT if your dog succeeds on chewing it, Pet Barrier agrees to replace one chewed collar per dog. Wait! There’s more from the Electric Dog Fence. The boundary wire for our Electric Dog Fence is super strong and effective that you do not have to bury it since it is coated with 2mm High Density Polyethylene coating (HDPe), you can just hang the wire on your fence and even place it on metal colorbond fencing and near metal sheds - now, most dog fence wires do not function well near metals but ours certainly does! PLUS… it has a 20-year UV rating so it will not break down in the sun like most PVC (Polyvinyl Chloride) wires. Our Electric Dog Fence boundary wire is made with 7 strands of 1mm copper core so if you decide to bury it and if you’ll do some gardening, it won’t even budge with your sharp shovels and the signal strength will still be excellent. 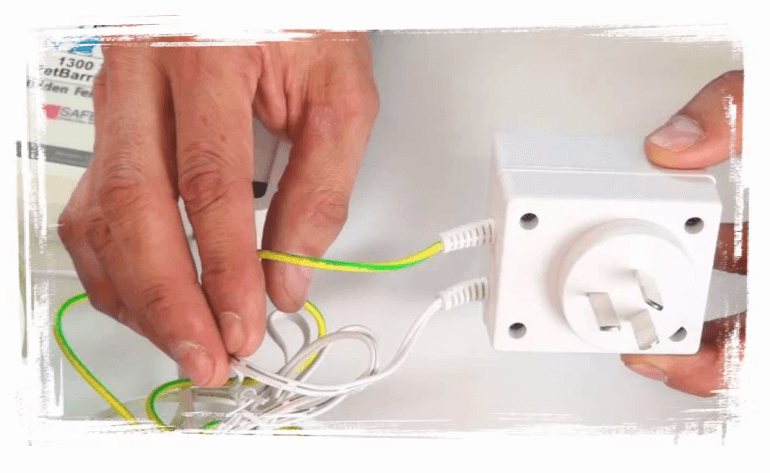 Now, if you’re still worried about your wire breaking, check out our Wire Break Alarm feature! We have an external Earth wire on the transmitter that will protect it from surge and lightning damages. Regardless of this AMAZING feature... we still offer a warranty that covers you for both surge and lightning damages for 3 long years! Having a long lasting battery life for the receiver collar is vital for an effective Electric Dog Fence and cost-saving for you. Good thing our receiver collars’ battery life is rated to last up to 2 years. Isn’t that awesome? Our Electric Dog Fence has more features and qualities that you can take advantage from - you can find out more in our FREE BUYING GUIDE… Click here to download. So what do I get in Electric Dog Fence package? 1 Dog Fence Collar - FM1200 / FM1200 Mini Receiver Collar (5 Levels) – choose standard or mini depending on your dog’s size. Optional Upgrade to the Premium R9 / R7 Mini Receiver Collars (8 Levels + Lifetime Warranty). Training Flags - for visual recognition. Training Guide - easy steps for effortless training and long lasting results. FREE Lifetime - Telephone Helpline. - Surge Protected Power Plug - power supply is regulated so if you get a power spike, it will not affect the distance of your radio signal and ‘correct’ your dog in the wrong area. - Anti-linger Feature to save more battery - beeps for 15 seconds once your dog stays at the warning zone before a stimulation is given. - Safety Shutdown Feature - will stop giving the corrections after 15 seconds of of getting stuck - reminds your dog to move back by correcting him once every 15 seconds. - FastReact® - 1/8th of a second reaction time to stop your dog before he runs through the boundary wire. - SafeLink™ Coded Digital FM Frequency – reacts only to your own Electric Dog Fence Signal. - Tri-Aerial System – exceptional reception no matter which part of the neck it is in. - Add more collars – add any number of collars to protect all your dogs in one boundary loop. - Available for tiny dogs and cats, swap the size to a standard mini size at no extra cost. 100m of our Dog Fence Boundary Wire is included in each kit. - Coated with 2mm High Density Polyethylene (HDPe) which is by far the strongest compared to others that only use Polyvinyl Chloride (PVC) - a synthetic thermoplastic material. - Has a 20-year UV rating for the HDPe coating. Note: wires that only have PVC coating can still break down in the sun even if it is UV stabilised. - You can also have our wire on a metal colorbond fencing and near metal sheds. - Can also be placed in Conduit if required (maybe on a gravel driveway). So why choose an Electric Dog Fence over a Traditional Fence? Simply because… any fence or garden can be made dog proof with the Electric Dog Fence. You don't have to spend thousands of dollars on traditional fencing when your dog will just dig into it or jump over it to escape (unless you spend another hundred dollars to extend your fence higher). Our safe and effective Electric Dog Fence is your dog’s freedom from danger and YOUR peace of mind.